This dish is oozing with sophistication. This classic combination of ingredients makes for a savoury and delectable treat. It can be served as a fancy brunch dish, or an appetizer for a classy dinner party. Preheat oven to 400 F. Prepare a sheet pan with parchment paper. Divide the two bunches of asparagus into groups of 6-8 depending on their size. Tightly wrap each bundle with a slice of prosciutto and place them on the sheet pan. Drizzle with olive oil, about 2 tablespoons. Sprinkle salt and pepper on top to season. Place the sheet pan in the oven for 20 minutes, until the prosciutto is crispy and the asparagus is cooked through. Meanwhile, to prepare the poached eggs, bring a pot of water to a gentle simmer and add the vinegar. In a separate bowl, crack the egg. As you gently place the egg into the simmering water, swirl the water with a spoon to keep the egg whites together. Leave the egg to cook for approximately 4 minutes, then carefully remove the egg and set aside. Repeat for the remaining 7 eggs. In a small pot, over medium heat, melt the butter. Once it has melted, add the balsamic and whisk. It will not combine completely but it will still have that amazing balsamic flavour. 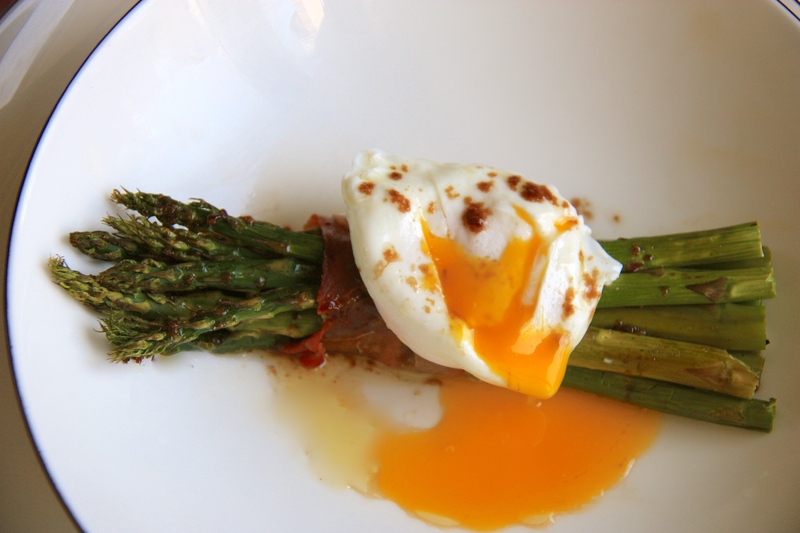 To serve, place a poached egg on top of one of the bundles. Drizzle with the balsamic butter. Enjoy while its hot! You can make the poached eggs ahead. Follow the above steps, but cook the egg until it is slightly underdone and jiggly. Remove and place in a container of cold water. When you are ready to serve your dish, bring a pot of water to a simmer and add the eggs carefully and cook for a minute, until they are heated through.